1. When you’re knitting with a yarn or stitch pattern that is new to you and you need to know how it behaves on your needles, particularly for gauge purposes. 2. When you really want to start the project but you don’t want/need to actually start the project yet. (See Sublist: Dealing with Startitis). 3. 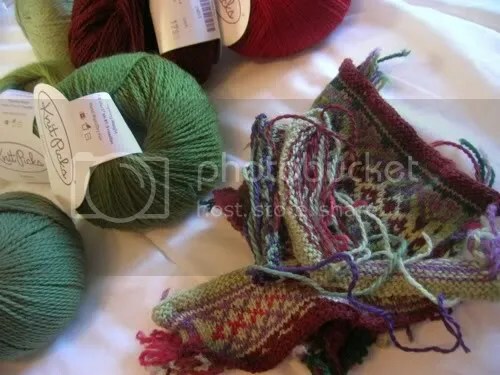 When you are knitting a stranded colourwork project in no fewer than 11 shades and stubbornly refuse to go with the pattern’s prescribed combination. This is all a roundabout way of saying I am swatching for Autumn Rose, and it’s all going wonderfully indecisively. For the last year I’ve been saying to myself I was going to start this sweater. I even flirted with the idea of making it for Rhinebeck last year, but the Cabled Swing Cardigan turned out so nicely and besides…there was the indecision. So that brings us to this week, when I saw Elspeth queued up Autumn Rose on her Ravelry, I summarily harassed her about it, she threw down the gauntlet by stating this was going to be her 2009 Rhinebeck Sweater #1 (because yes, she makes more than one Rhinebeck sweater), and some sort of switch flipped in my brain and I knew I had to get back on this. Because Elspeth is a teeny tiny little person who also knits like the wind, and the thought of watching her zip through the (potential) sweater of my dreams while my yarn gathered more dust was just too much to handle. And so I am back to the swatching. I spent more hours than I would care to admit yesterday working on the swatches. It is true that there may have been some avoidance of the grading (oh god don’t make me face another stack of exams…aghldhlhglddlhgkl), but mostly I just want to decide on a frakking colour scheme already. I’m close, I’m getting very close. I’m using, from the Palette arsenal, a collection of purples, reds, and greens, in what, in my head at least, calls up images of a beautiful art deco garden or stained glass window. It pains me to admit that there is going to need to be at least one more swatch before I can finally nail down a scheme. I think the final decision will be some combination of the two swatches above, but slightly more like the second of the two (also pictured here below). The lipstick pink in the bottom of the first swatch is right out, and the third will incorporate some further fine-tuning of the cross-hatching panel colours and the outer shades of the ‘rose’, and use the duller green in the top half of the second instead of the paler shade used in the bottom. And if you’ve followed me this far, allow me to pause for a moment and just say how much I love the brightness of the middle section. I could stare at it all day. It makes me think of sun shining through windows, which is not only attractive in a colourwork pattern but also very appropriate for something to knit in the spring. My term is inching towards being finished and I can just about see the respite at the end. Respite which will, hopefully, be composed of knitting and not just swatching. And I bet that Elspeth already has her colours decided, Drat. I can’t claim to have fully followed you on the changes, but given what you have so far it is going to stunning (not like there was any doubt). I love Autumn Rose, but I know I’ll never knit anything with that much colourwork in it- I don’t have it in me. I know that you are having a difficult enough time about colour decision, but for what it’s worth…. I always thought that if I ever knit this sweater, I would do it in white and shades of blue (and probably a bit of grey and teal for depth), like delft. And you would look awesome in blue. Regardless, good luck- it’ll be an awesome Rhinbeck sweater no matter what! Nothing like a little external motivation to get us going! Good luck with the swatching–you’re so close! 1. I have not swatched. Knowing me and gauge, this could put me behind! 2. I have to finish a few things before I can get cracking on Autumn Rose: The Reckoning. What I’m trying to say is: play on, player. I’m right behind ya! That is absolutely gorgeous! 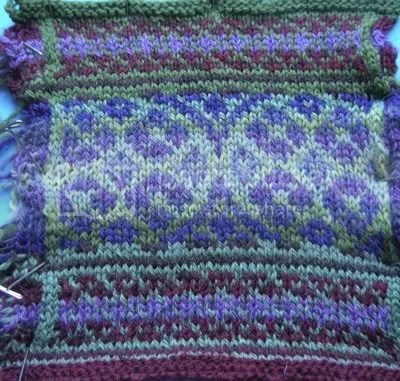 Stranded colorwork is one the few thingsa that makes me sweat and tremble and cry at the thought of trying it. I despise swatching. I know I should do it more, it would save me a great deal of heartache afterwards but I did do it for my Autumn Rose – almost done but the steeking. I wasn’t nearly as brave as you to venture out into new colours as the ones featured appealed to me so much. Its going to be fun to watch yours evolve. Those colors are beautiful! I can’t wait to see the final palette. 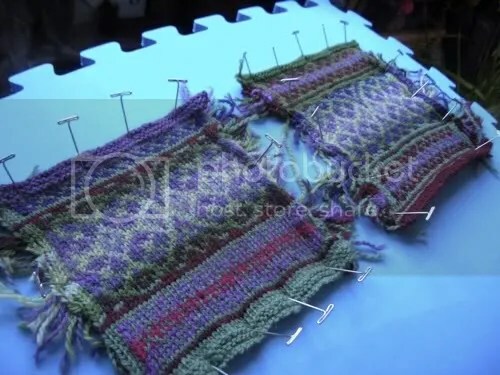 I’ve had to swatch since having shoulder issues (tendonitits and frozen shoulder) since its definitely affected my knitting, prior to that I hardly ever bothered. After reading this post and seeing your swatches, I’ve come upon (another) reason not to swatch: the swatches are so lovely, how could you ever make a decision???? They’re really beautiful. I can’t wait to see your pick, and then … your progress. I simply love the color combinations and you’re going to end up with a gorgeous sweater!